Curved bay shutters are becoming more common. 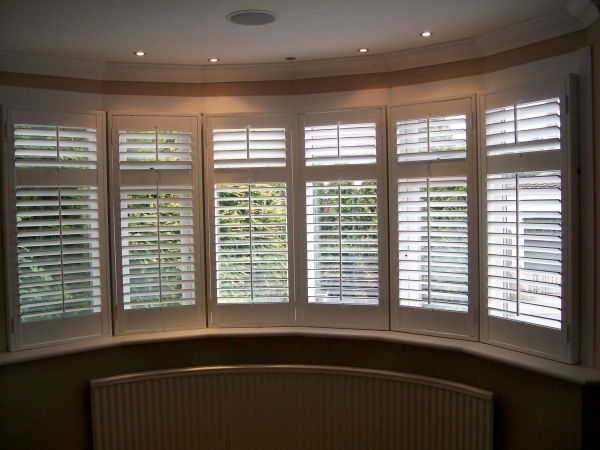 The shutters in Tulse Hill, South East London are fitted to a sunshine bay or a curved bay. Curved bay shutters are becoming more and more common place, particularly in the Tulse Hill area. Fitting curtains on a curved bay can mean having heavy drapes hanging at the windows, blocking out essential light and becoming a bit of a dust trap. Installing shutters at a curved bay means that you get lots of light pouring into the room from all angles, the whole point behind a sunshine bay window. This curved bay window is very typical of a sunshine bay or curved bay in the Tulse Hill area. The Tulse Hill shutters have been fitted in their own individual shutter frames. This is partly due to the curve of the window and partly due to the architrave surrounding each pane of glass. The bespoke shutters have been manufactured in a specific colour at the customers request. Custom colour shutters are a frequent request here at Shutterly Fabulous, we often match to Heritage colours, or to Paint and Paper Library colours. Muted neutral shutter colours are very of the now and as such customers are ordering custom shutters to match home furnishings in similar neutral colours and shades. These individual shutters in individual shutter frames on this curved bay in Tulse Hill, South East London really set themselves apart from other shutters and as such have become a huge focus feature of the room. These are our standard colours, which our bespoke shutters are manufactured in at no extra cost. Additionally we have a range of stains. Again these are our standard shutter stains and we will manufacture our bespoke shutters in this range at no extra cost.